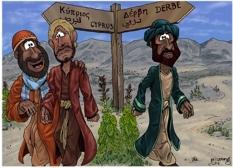 36 After some time Paul said to Barnabas, “Let’s go back and visit each city where we previously preached the word of the Lord, to see how the new believers are doing.” 37 Barnabas agreed and wanted to take along John Mark. 38 But Paul disagreed strongly, since John Mark had deserted them in Pamphylia and had not continued with them in their work. 39 Their disagreement was so sharp that they separated. Barnabas took John Mark with him and sailed for Cyprus. Unspecified in the verses above. I have set the scene fairly early in the morning. The sun above provides the lighting for this scene. To the right we see Paul/Saul setting off (some what angrily!) towards Derbe, whilst Barnabas (in Orange) is comforting his nephew John Mark, & they are heading off towards the island of Cyprus. This was a scene commissioned by a sports ministry organization. It shows Saul/Paul going off in one direction & Barnabas along with his nephew John Mark going off in the other. I have used a sign post to illustrate where they are heading. 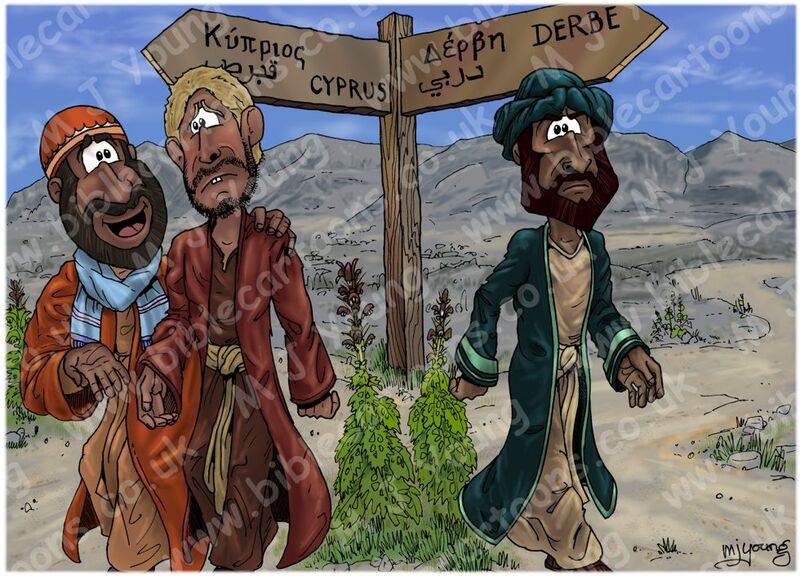 We know from the scripture above that Barnabas & John Mark went to the island of Cyprus. The following verses tell us that Paul chose a man named Silas, they travelled throughout Syria and Cilicia, strengthening the churches there. Acts 16 verse 1 tell us that Paul came to Derbe and then went to to Lystra, where he met Timothy. Tarsus (Paul/Sauls’s home town) is in modern day Turkey, & beyond that, toweards the interior of the country is Derbe, with Lystra still further inland. The plants you can see in the foreground are Syrian bear’s breech (Acanthus syriacus) a rather spiky, prickly plant. I thought that would be indicative of the men’s moods at this time!